Monet’s paintings are much loved now, but they weren’t when he first painted them. People complained they looked unfinished, like only an “impression” of a scene. 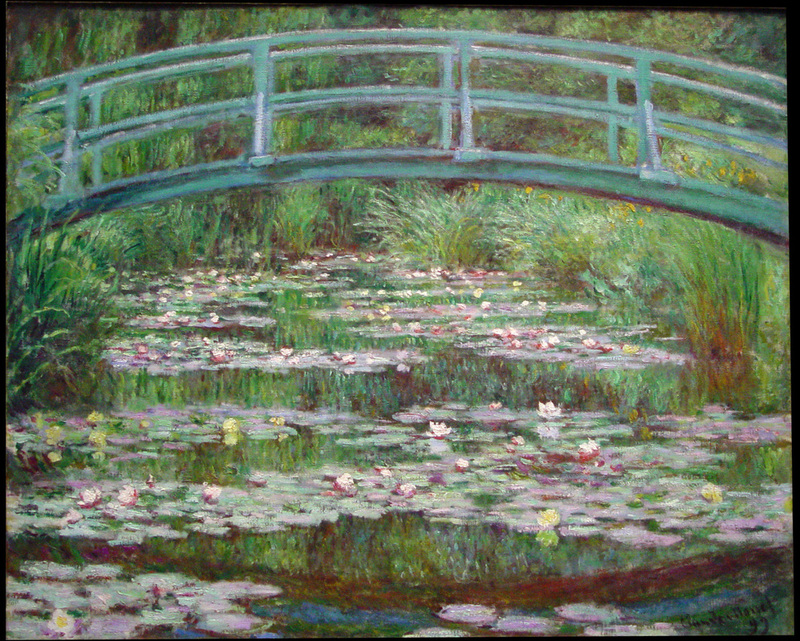 This gave Monet and his friends the name, Impressionists. Renoir was one of the leading painters of the Impressionist group, along with Monet. His paintings celebrate beauty. He was so passionate about painting that he continued when he was old and suffering from severe arthritis which crippled his hands. Renoir then painted with a brush tied to his wrist. In spite of the arthritis, Renoir never lost his love for life and painting. He painted a picture of flowers on the day he died. He left behind over two-hundred paintings. American artist, Grant Wood's self-portrait. Grant Wood's famous painting, American Gothic. Week 3 - Grant Wood (1891-1942) U.S.A.
By painting simple scenes of the land and people he knew best, Grant Wood helped create an important, all-American style of art (Regionalism). Grant Wood’s paintings show the love he had for the people and customs of the Midwestern United States. Grant Wood particularly loved the farmland of Iowa. His paintings were popular during the Great Depression. Grant also painted pictures of famous American legends. Rembrandt is considered one of the greatest painters and printmakers in history. Many of his paintings are self-portraits, portraits of other people, or Biblical scenes. Rembrandt, a Baroque period artist, is known for his use of chiaroscuro -- using darks and lights for dramatic effect. Georgia O’Keeffe was a pioneer of Modern Art and was one of the greatest American artists of the 20th century. She is known for her large scale paintings of natural forms and flowers at close range. After the death of her husband, she moved to New Mexico. The stark landscapes and stunning vistas there inspired her to paint the area, and she is also admired for her art of the Southwest. Albert Bierstadt was a German-American known for his lavish, sweeping landscapes of the American West. "Picturesque" describes a particular type of landscape that is striking and evokes awe and amazement in the viewer. Bierstadt was one of the American landscape painters who popularized this concept in their stunning, expansive views of areas in our country that had never been seen before by most Americans. He was also considered part of the Hudson River School of painters in New York and the Rocky Mountain School. Katsushika Hokusai was a Japanese artist, ukiyo-e painter and printmaker of the Edo period. Hokusai is best known for his woodblock print series Thirty-six Views of Mount Fuji. His book of manga, sketches or caricatures that influenced the modern form of comics known by the same name, was published in 1814. Albrecht Durer was a brilliant painter, and many consider him to be one of the greatest draftsmen. Probably his biggest artistic impact was through the medium of printmaking. His vast body of work includes religious works, numerous portraits and self-portraits, copper engravings, woodcuts, and watercolors. The featured painting of the week is Durer's watercolor, Young Hare, a masterpiece of observational art. Leonardo da Vinci is widely considered to be one of the greatest painters of all time and perhaps the most diversely talented person ever to have lived. He was a painter, sculptor, architect, musician, mathematician, engineer, inventor, anatomist, geologist, cartographer, botanist, and writer. Da Vinci was a genius and a true Renaissance Man. His small portrait painting, Mona Lisa, is probably the most famous painting known today.